Back issue of the PWCPA, Inc. 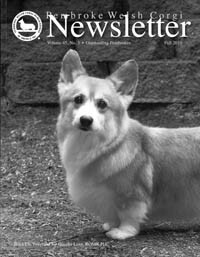 Newsletter for FALL, 2010. 148pps. The Outstanding Pembrokes issue features BISS CH. TALLYRAND NO GREATER LOVE, ROMX PHC on the cover with accompanying article Outstanding Pembrokes. Articles: No "Old Dog" .... Just "New Tricks". Also includes Specialty Reports with win photos: Garden State, Golden Gate, Greater Atlanta, Mayflower, Potomac, Southern California and ads featuring winning Pembrokes and more. Available only as long as this supply lasts.